Plum orchards once covered The Valley of Hearts Delight (what is now known as Silicon Valley). Many homes are still graced by individual specimens of these prolific fruit producers, and it is easy to add one to your landscape, as well. ​Plums are members of the Rose family, in the Prunus genus. This makes them cousins to other stone fruits, such as peaches, nectarines, and cherries. 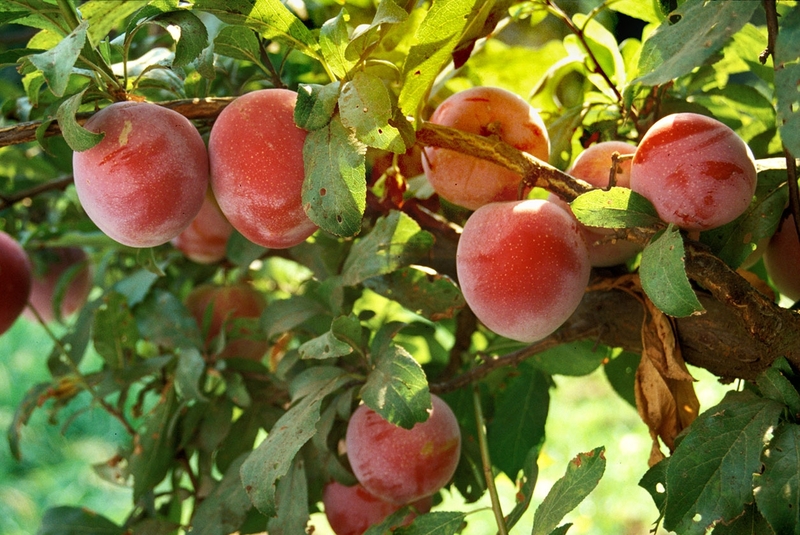 One variety of apricot (Prunus armeniaca) is so closely related that it is actually a plum! Fruits of the plum tree are called drupes. When deciding on a plum variety, keep in mind that plums can be sweet or tart, early or late blooming and ripening, standard size, dwarf, or semi-dwarf. Two varieties are commonly grown in California: Japanese plum (Prunus salicina) and European plum (Prunus domestica), but there are others. Some European plum varieties do not require cross-pollination, but all plum trees produce far more if there is a second tree nearby. Japanese plums bloom and mature earlier, but European plums tend to be sweeter. ​Standard plum trees can grow to 30 feet tall and 25 feet wide, semi-dwarfs can be 15 feet wide, and dwarf varieties rarely need more than 10 feet. Plums come in skins of many different colors, from yellow, to red and purple, to nearly black. The interior fruit can be yellow, white, red, or green. Commercially, plums grown to be consumed as fresh fruit are called “sugar plums”, while the remainder are grown to be dried and sold as prunes. Prunes are almost exclusively made from European plums. You can also find plum-apricot and plum-cherry hybrids! Plums love California’s mild winters and hot, dry summers. While they prefer more sandy soil than the Bay Area tends to have,they are pretty tolerant of our clay, as long as the drainage is good. They do need a lot of sun. Plums are best started from certified disease-free root stock. You can also start a tree from a friend or neighbor’s tree by taking one of the many suckers that tend to appear. Suckers root more easily if they are dipped in rooting hormones (auxins), but they will create their own auxins in a day or so. If starting from seed, plums should be planted 3 inches deep. Be sure to mark the spot so you don’t lose track of your new baby! The most common plum pests in the Bay Area are aphids, mites, and San Jose scale. Other pests include Oriental fruit fly, plum curculio, mealybugs, redhumped caterpillars, green fruit beetles (Cotinis mutabilis), and mealy plum aphid (Hyalopterus pruni). Sticky barriers can reduce the impact of many crawling insect pests. Fungal diseases that affected plum tres include canker, brown rot (Monomania fructicola), and shot hole, also known as Coryneum blight. One of the most common problems faced by plum tree owners is overproduction. Overproduction, or overbearing, can cause broken limbs, so it is important to thin fruit to no more than one fruit every 2 to 4 inches. Don’t be concerned if your plums have a whitish coating on them. This is a protective epicuticular wax known as “wax bloom” and is easy wiped off. ​Add a plum tree to your landscape this spring for decades of delicious summer fruit and year-round jams and jellies!